High humidity, burgers on the grill, fireworks, and a fleet of American flag t-shirts– it can only mean one thing: it’s time to celebrate the Fourth of July! Naturally, our favorite way to commemorate the summer holiday is to craft an icy-cool cocktail that fits the patriotic theme of the occasion. 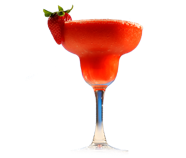 This Independence Day, pop open your bottle of IZKALI Silver Tequila and try out this quick and easy Frozen Strawberry IZKALI-Rita recipe that’s sure to be a hit at your red, white, and blue bash. Place ice in blender and crush for 15 to 20 seconds. Add frozen limeade, IZKALI Tequila, Triple Sec, agave nectar, and strawberries. Blend until smooth. Pour mixture into glasses rimmed with salt or add a pinch of salt. Add a strawberry to the rim for an extra patriotic garnish. This tasty treat serves six people. Enjoy!